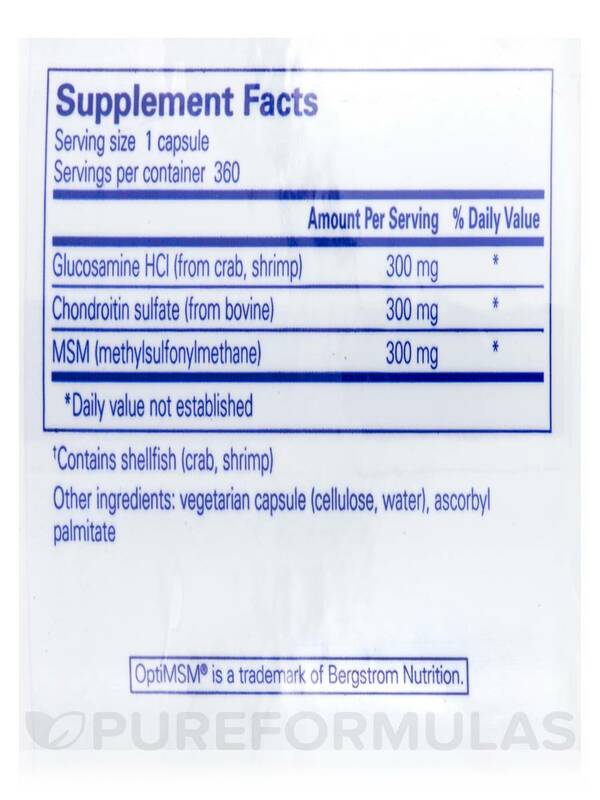 This Glucosamine + Chondroitin + MSM by Pure Encapsulations works well for people who do not have Shellfish allergies. There are few "added ingredients." I used to buy the 120 capsules but they were out of stock and I bought this size and I realized that I am saving money and getting the same excellent medicine for my dogs. In order to support healthy joints‚ your body requires an array of compounds. 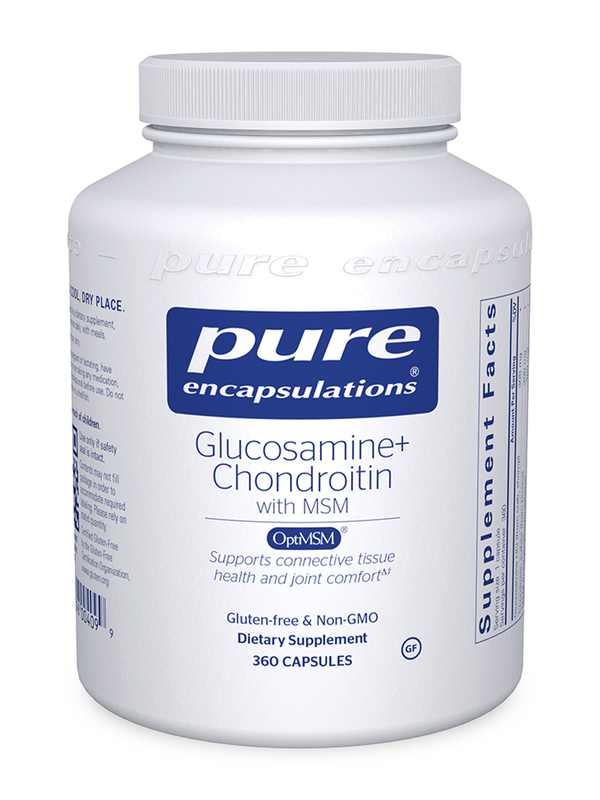 Glucosamine is a natural compound contained in cartilage around the knees and other areas‚ which may alleviate mild stiffness or swelling. Chondroitin‚ meanwhile‚ is another natural molecule that is the primary building block of the cartilage that cushions your joints. Finally‚ MSM (methylsulfonylmethane) provides sulfur that can enhance the strength and structure of proteoglycan proteins found in connective tissues. Glucosamine + Chondroitin with MSM by Pure Encapsulations is a supplement that provides all three compounds in convenient capsule form. Every capsule provides 300 milligrams of bovine chondroitin sulfate‚ as well as 300 milligrams of glucosamine HCl derived from shrimp and crab. 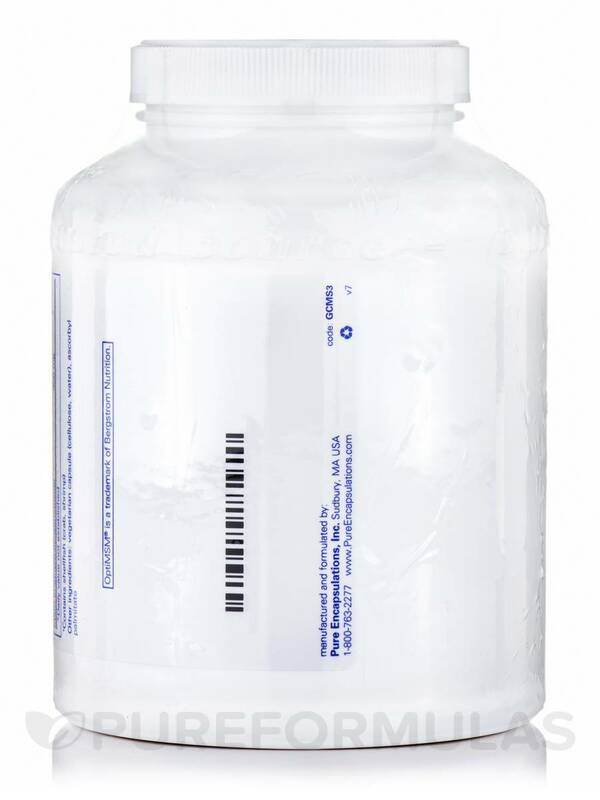 The former helps maintain cartilage by promoting the absorption of water and other fluids‚ while simultaneously supporting new cartilage production and working to block the enzymes that can break down existing cartilage. The latter works to maintain healthy activity of matrix metalloproteinase (MMP) enzymes‚ which may boost the integrity of your cartilage. Normal wear and tear or an injury may result in the weakening of cartilage tissues‚ which are located between bones and joints; as a result‚ the bones may end up rubbing against each other painfully. A supplement like Glucosamine + Chondroitin with MSM may decrease the chances of this‚ especially as you age. Supporting an improved range of motion can help you participate in the activities you love without discomfort. It can also allow you to exercise regularly‚ which results in additional health benefits. Glucosamine + Chondroitin with MSM provides ingredients that are nearly impossible to get through dietary sources. Take three capsules daily‚ in divided doses with meals. At the recommended dosage‚ each 360-capsule bottle of Pure Encapsulations' Glucosamine + Chondroitin with MSM should last for about four months. As a dietary supplement‚ take 1 capsule‚ 3 times daily‚ with meals. If pregnant or lactating‚ have any health condition or are taking any medication‚ consult your health professional before use. 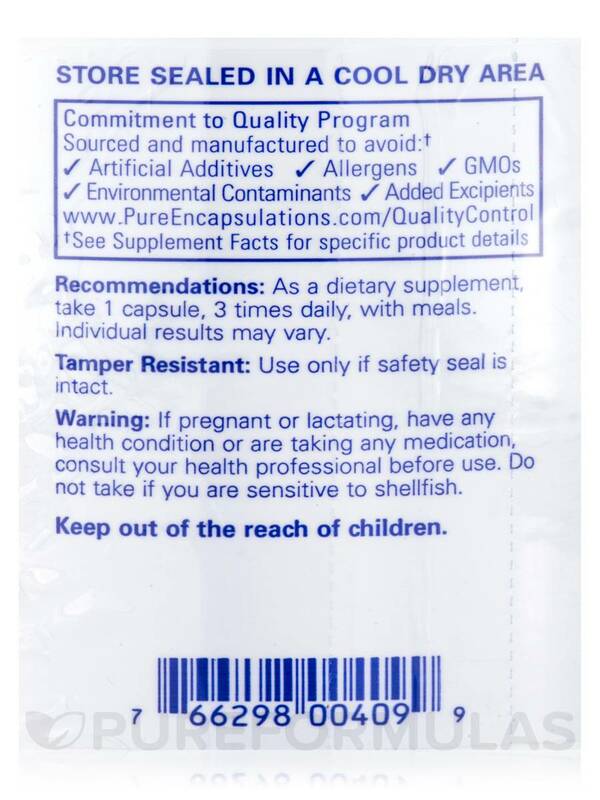 Allergen Caution: Contains Shellfish (Crab‚ Shrimp). Do not take if you are sensitive to shellfish. I've got a lot of arthritis - hands, fingers, spine and neck. I take Glucosamine + Chondrotin with MSM by Pure Encapsulations every day along with a few other products and when I skip taking this, I feel it! I ordered Glucosamine + Chondrotin with MSM by Pure Encapsulations though I perfer the Jarrow line, which contains way more chondroitin. For the price, I think I’ll order Jarrow again. I dislike the less amount of supplement and cost ratio. My husband and I both take Glucosamine + Chondroitin with MSM by Pure Encapsulations and we are not senior citizens. We do exercise regularly. I noticed that when I stopped taking it for a couple of weeks that my joints, especially my knee, that I had arthroscopy surgery on, started to pop and ache more. It took me a while to put 2 and 2 together. I ordered Glucosamine + Chondroitin with MSM by Pure Encapsulations because of the amount of micro break-down of my bones my impact sports put me through. I haven't noticed a difference, which isn't to imply that it isn't helping. I think it's one of those things that's hard to gauge unless one's condition was pretty noticeable from the start. I trust the brand. I'm not able to say that this confidence in the brand comes from personal experience. However, I've heard good things about it being on of the better brands on the market. I think it's okay to take these as a preventative measure as an athlete. 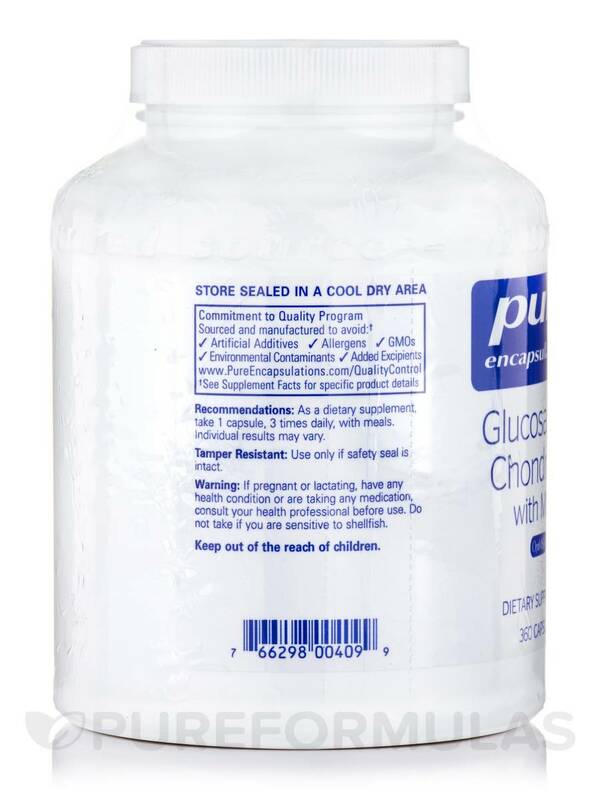 Glucosaminr + Chondritin with by Pure Encapsulations has no magnesium stearate.